We accept all types of servers and IT equipment no matter what their purposes was; applications, catalogs, communications, computing, databases, faxes, files, gaming, mail, media, print, proxies, and the web. All servers typically have associated hardware that can be recycled or reused after decommissioning. Server Hardware we recycle from servers include towers, racks, disks, RAM, CPU’s, hard drives, cables and more. We know how difficult the process is to upgrade IT equipment, especially when it comes to disposing of decommissioned servers. Fortunately, California Electronics Recycler can make the exchange process efficient when you decide to dispose and recycle your Servers. When we dispose of decommissioned servers we will eliminate all data to best protect your business and confidential information. Upon Data Destruction of your Servers we can provide you a Certificate of Data Destruction for added security measures. After the data is destroyed, California Electronics Recycler will recycle the Servers by re-purposing them or scrapping them with one of our certified R2 downstream vendors. We have a few techniques to handle and destroy the data that is left on your IT servers. The first technique we consider for data destruction is through our Professional DoD compliant software. Through Data Wiping we completely wipe your data clean from your servers’ data storage devices for good. Your data is irrecoverable, untraceable, and completely destroyed, PERIOD. For added security measures we can destroy your data through our Degaussing Machine. This process removes the data by demagnetizing the memory from the iron oxide or chromium dioxide which eliminates your data through randomizing the recorded data pattern. If requested, we can physically destroy the data with our 4 ton hydraulic press where it will be crushed, thus splitting the data disks completely and the device will no longer be functional. All of our data destruction processes are DoD compliant and we guarantee that your data will be securely destroyed and disposed of properly. 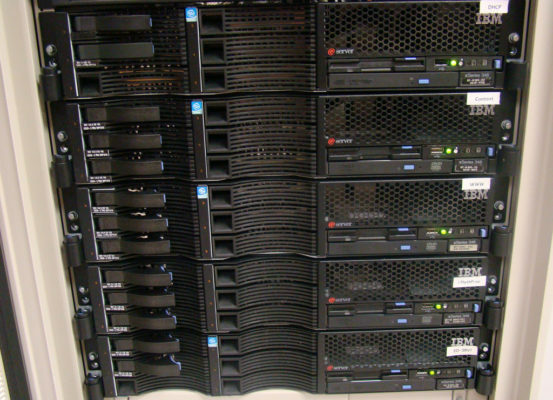 Why should you recycle your decommissioned servers? Servers are big and bulky, taking up a lot of space, which is not good for landfills. They typically contain large amounts of data of confidential and sensitive information. If the servers’ data is not destroyed properly and it fell in the wrong hands your information could be at risk. Servers contain valuable metals and materials that need to be recycled to reduce the amount of energy that comes with mining and producing new products. They have materials that are toxic for the environment if they are disposed of improperly. Through recycling you make a difference today that helps shape our future. If you dispose of your old servers improperly you could be at risk of a security breach or even develop a bad reputation for not recycling. Deciding on an electronics recycler to dispose of your decommissioned servers takes a lot of trust. Choosing a reputable recycling center, like California Electronics Recycler, is important for the protection and security of your data information. It is important to also use a recycling center that keeps your servers and electronics out of landfills and from being shipped overseas. California Electronics Recycler is a no-landfill electronics recycling center. When recycling your large IT servers we make the job easy and quick. We have a fleet of vehicles and a professional team that can quickly and easily pickup your decommissioned servers. We may even transport them free of charge depending on the amount electronics you plan to recycle. When recycling your server we make it a priority to destroy all the data left on any of the storage devices. Call (800) 282-9327 for more information about server recycling, or schedule a Free Pickup.